The duck never asks itself whether it's a duck or not. It's duckness is ingrained in it's DNA. It flies south in the Fall and north in the Spring, never questioning "Why?" It is a duck after all. Ducks, like geese, fly in formation, each duck taking it's turn leading the flock in flight. 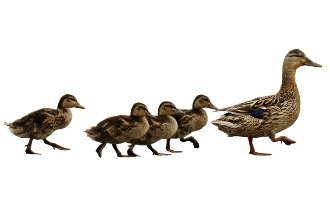 When the lead duck gets tired, it fades from the front and is enveloped back into the fold of the flock, naturally another bird takes the lead. They are ducks after all. This is what they do. "Synergy comes naturally from the quality of the relationship, the friendship, trust, and love that unites people." I have know clue if ducks love one another, what I do know is ducks never question the importance of team building, training, whether their flock represents them well enough, or if another flock might be a better fit for them. Ducks instinctively know without teamwork, not only will they not arrive at their happy destination, their goose is cooked. Ducks united by DNA and the common instinct reach their breeding and feeding destinations faster, safer, and easier. They live fully engaged in the venture - committed - synergized. Like ducks, people naturally gravitate toward organizations that will shelter and protect them and make their life easier than if they were left to fend for themselves. As humans we want more than a chilly nest and a little grain to peck at. Most of us want money, freedom, and the respect of our peers. So why is there so much failure when it comes to effective team building? The simple fact is, when people's emotional, physical, spiritual, and financial needs are not being met, their performance and attitude suffers. Build teamwork into the DNA of your organization. Change the way your organization connects emotionally to your people by changing the way you communicate your ideas. Connect emotionally by meeting the psychological needs of your teams. If an individual's thoughts and actions don't align with those of the organization, both are degraded. Positive team building creates synergistic teams of individuals who align with the organizational ideas and structure. In a rapidly changing world filled with complex environmental issues, a border-less global economy, and ever increasing competition, the importance of team building takes on a dangerously sharp edge. Simply, if you don't realize the importance of team building and don't build teams that get the job done, you cooked your organizational goose. Learn more on the importance of team building.